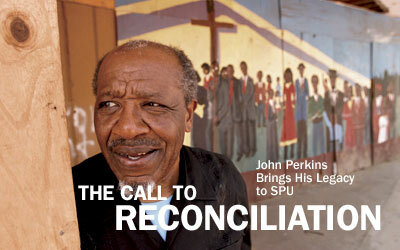 The John Perkins Center at SPU is what the legendary civil rights leader calls “the fulfillment of a lifelong dream.” Perkins visited the campus in October to officially open the Center and call Seattle Pacific to the work of reconciliation, leadership training, and community development. In a personal letter to the SPU community, John Perkins recounts his life’s journey and how it led him to a radical, gospel-centered vision for serving the poor and oppressed. He writes that he hopes the Perkins Center at Seattle Pacific will equip students to carry a “holistic gospel” into the world. How Can SPU Better Serve Our City and Our World? “This conference gave us a vision of what the Kingdom of God is like — and what this campus could become,” says Joe Snell, assistant director of student programs and director of intercultural affairs at SPU. He’s referring to the National Christian Multicultural Student Leaders Conference, which welcomed college students from across the country to SPU this fall. Over 30 weekends a year, Alumna of the Year Marilyn Meberg ’61 has thousands of women all over the country laughing until they cry. The author, humorist, and marriage and family counselor is one of a beloved ensemble of speakers at national Women of Faith conferences. Greet the Alumna of the Year at Homecoming and Family Weekend!